The vibrant city of Berlin is known for its rich cultural history and strong film, music and arts heritage. In the 1920s the city was the centre of the Weimar Culture movement and it was during this period that a certain young German woman first emerged onto the flourishing Berlin theatre and cabaret scene. Berlin was home for many years to Marlene Dietrich, one of the greatest stars of vintage cinema, and her spirit lives on in the city today. From self-guided walks around the streets she grew up on to the fabulous Marlene Dietrich Collection museum exhibition, there is plenty to satisfy even the most avid fan. Marlene Dietrich was born at Leberstrasse 65 in Berlin’s Schöneberg district on 27 December 1901. It’s possible to visit the building she was born in, which can be easily identified by a plaque on the outside wall commemorating the event. The neighbourhood the young Marlene lived in is still a thriving residential area and as this part of Berlin was undamaged during the air raids of World War II, there are lots of historical buildings still standing. These old buildings and the many tree-lined streets give the district a vintage European charm. A permanent collection housed at the Berlin Film Museum, this impressive display of Marlene’s personal possessions is a must-see. The collection documents every stage of Marlene’s life, from her early days in Berlin, right up to her death in 1992 at the age of 90. One of the most extensive exhibitions of its kind, the collection includes film posters, photographs, books, show costumes and much more. The collection of vintage clothes, designer shoes and priceless jewellery is incredible and there are a staggering 400 of Marlene’s hats alone. Among the most fascinating items on show are Marlene’s letters. Approximately 300,000 pages of written documents include letters from Hollywood stars such as Yul Brynner, Billy Wilder, Douglas Fairbanks Jr and Maurice Chevalier. There are also letters from Orson Welles, Noel Coward and Ronald and Nancy Reagan. Modelled on Hollywood’s Walk of Fame, Berlin’s version stretches outwards from the city centre from Potsdamer Platz. 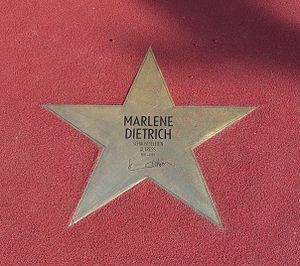 The foundation stone was laid in 2010 and, shortly after, Marlene Dietrich became the first star to be honoured by the memorial. Her bronze star displays her name, dates of birth and death and an engraving of her personal signature. An interactive mirror installation at the memorial allows visitors to appear to have their photo taken with their chosen star as an extra attraction. Despite a career that took her all over the world, Marlene Dietrich was laid to rest only a short distance from the house in which she was born 90 years earlier. 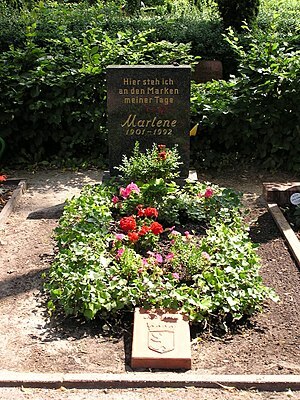 Marlene was buried near her mother at the Städtischer Friedhof III. Her grave is marked by a headstone with the inscription “Hier steh ich an Marken meiner Tage” which translates as “Here I stand at the milestone of my days” and is taken from a sonnet by Theodor Körner. Visitors wishing to pay their respects may purchase a flower outside the cemetery to place at the grave if desired. Berlin is renowned for its wonderful bakeries, offering all manner of delights from breads and pastries to spectacular cakes. These bakeries offer many options for food on the go and are perfect for grabbing a quick snack or a spot of lunch between sightseeing. They’re cheap, too, so won’t break the bank and will allow you to save your money for your evening meal. To ensure your Euros go even further, it’s always a good idea to shop around for the best exchange rate before you leave home. Rates offered by banks, travel agents and other foreign exchange providers vary dramatically and some will charge hefty commission fees on top. Researching current tourist exchange rates can help you choose the best option. Many of the highlights of a trip exploring Marlene Dietrich’s Berlin take place outdoors so it’s advisable to check the weather ahead of your trip. Berlin can be fairly wet throughout the year so dressing appropriately and taking waterproofs or an umbrella will keep you comfortable and prevent disruption to your plans. Previous Post Happy International Dance Day!